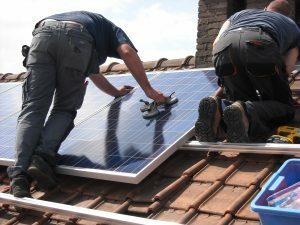 Solar panels and traditional materials can be a better roofing choice than a rooftop garden. A movement toward greener roofing materials is well under way. In some places, such materials are literally alive. That’s become the case in New York City, where residents and businesses are turning their rooftops into gardens, according to the New York Times. The Times reports that 1,200 buildings in the city have so-called green roofs. Susan and Neil Whoriskey have one of those green roofs, in Brooklyn Heights. Last fall, the couple hired Inger Staggs Yancey, of Brooklyn Greenroof, to install a sedum garden on a 250-square-foot section of their townhouse roof. Still, using plants as roofing material isn’t always practical. And sometimes it may even be better for the environment to use more traditional roofing methods and materials. Or perhaps it would make sense to install a solar roof. David Bange Roofing is your trusted contractor for installing the best roof for your Southern Florida home.